It’s time once again for another rousing addition of the YuleBlog! Following a new mantra, we’ll now be taking a look at series that have finished. This way, I don’t end up doing a surprise double season, and you guys can see more different series. 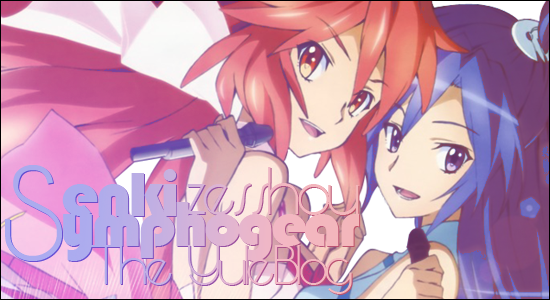 This season, we’ll be taking a look at the musical wonder, Senki Zesshou Symphogear! So we start out here in the rain. Ominous sayings that involve birds singing even as they die. Obviously not symbolism for anything. Here we are at a graveyard. Either this whole series is going to be really depressing, or it’s going to be told in flashback. Yup, there’s the flashback cue. 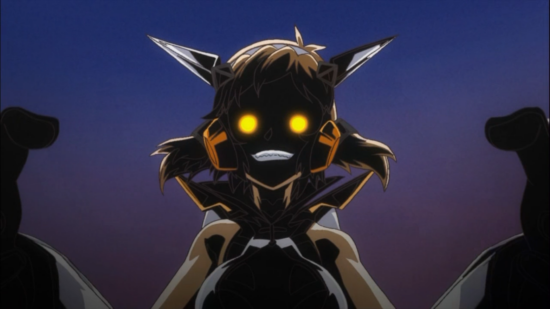 So spoiler alert, this Hibiki chick is going to end up dead. Doesn’t that just inspire confidence and make you want to keep watching? I know I’m excited. So here we are, two years ago. We have a concert for a group called Zwei Wing. This must be Hibiki. And here we have the members of Zwei Wing, Tsubasa and Kanade. One is obviously more shy about performing than the other. Apparently something is super important about this concert today. Oooh, glow sticks. Words to live by here: enjoy your performance or no one else will. We’re only 5 minutes in to this show and we have an awesome concert insert song. this one is called Gyakkou no Flugel, and it looks pretty cool. The animation for it is very well choreographed. One of the reasons it sounds so good is that Tsubasa is Nana Mizuki, who always does a great job singing. I’m not one for concerts, but this one looks like it’d be fun to go to. Plenty of lasers always makes for a great show. Meanwhile, we have some science stuff happening downstairs. And now for another song, this one is Orbital Beat. Too bad it got cut off, I like it better. This here is the Noise, the unexplained evil for this series. Apparently it turns people to dust. And now for the signature of the series, the transforming singers. 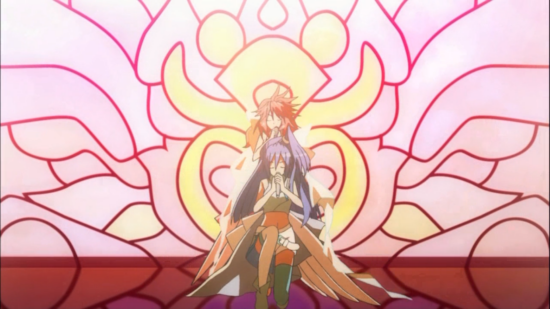 By singing a song, Kanade and Tsubasa transform and get super powers and awesome weapons. It’s a little more impressive than yelling Henshin. 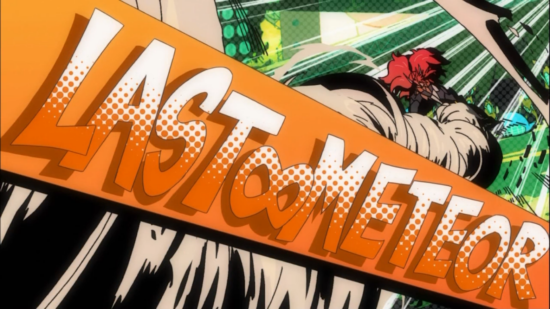 The attacks even get half a second with the name displayed. It has less flair than calling it, but they have to keep singing, so they can’t really stop to yell attack names. Why is Hibiki still here? If everyone else is gone, she should have gone with them. I have a feeling we’ll be seeing more of this brand of stupidity as the series goes on. Maybe she’s just super ditzy. 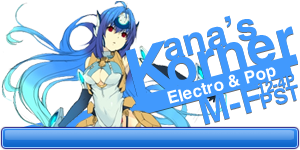 Good thing Kanade is here to save her. Doesn’t look like she stands much of a fighting chance though. 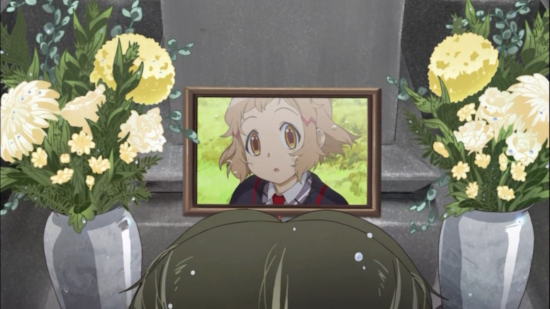 And now Hibiki is dead. That’s it everyone, series over. Time to go home. Seriously though, let’s see how Kanade handles this new development. She’s singing in… Latin? I can’t tell. 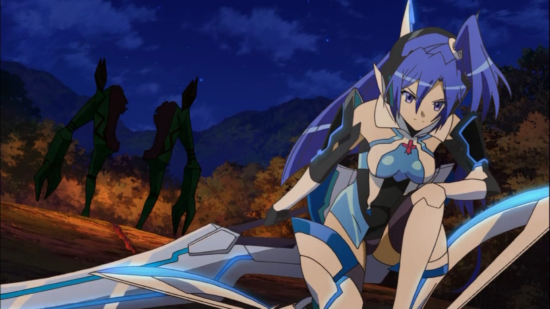 Whatever it is, Tsubasa doesn’t want her to, so it’s obviously a kamikaze attack. Yup, she’s dying. 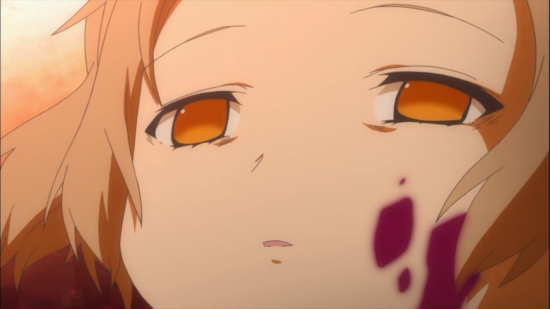 First episode and someone is already dead. Meanwhile, back in the present we have a private music academy. Do you get the theme of the show yet? Hibiki is showing that, once again, she is a huge ditz. Good thing she has friend who’s willing to put up with her. Looks like Tsubasa is still singing after Kanade’s death. Good for her. That’s an interesting shaped scar. Looks like the Noise are still an issue, and normal weapons don’t work at all. Feels like Evangelion. Only instead of giant robots, we have Nana Mizuki to fight them with music and swords. I prefer this method. These attacks are pretty vicious, but they have some cool names. I like the Blue Flash one. 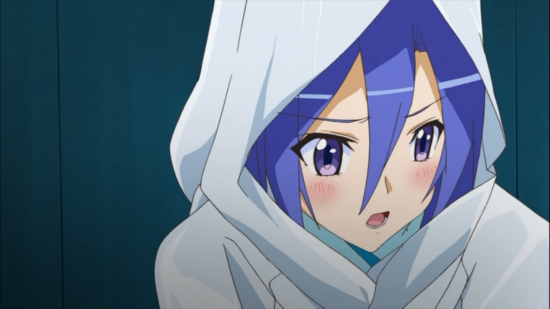 When Tsubasa isn’t busing killing things, she’s just a regular high school student. Hibiki’s friend has a decent point. No one really goes for CDs int his digital age, but they are a nice collectible. Oh snap, there are piles of ash everywhere. That means there’s Noise about. Good for Hibiki for being brave and helping out a little girl, but she doesn’t really inspire confidence. She’s trying really hard though, I have to give her tons of credit for that. Having someone die for you must be a great motivator to save someone else. Oh darn, the Noise caught us. 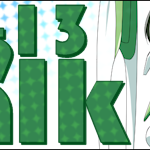 And in a surprise twist, Hibiki is a transforming singer. 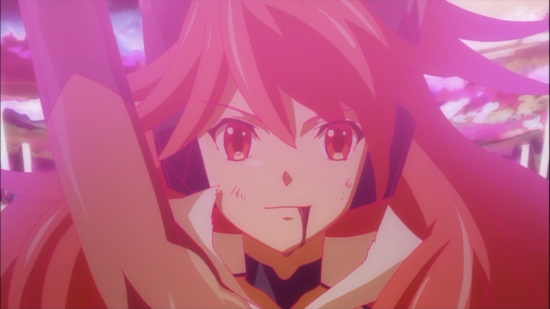 Apparently her song weapon is Gungnir. 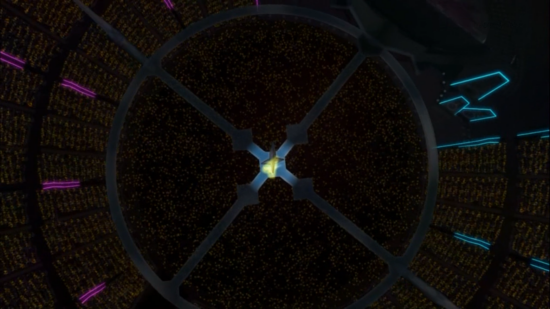 I’m no psychic, except for that I’ve seen the series already, but I think that’s Kanade’s old weapon. Looks like the first the transformation is a little rough, but we’ll have to wait for next week. The song here at the end is actually the opening for the series, Synchrogazer by Nana Mizuki. I’ll talk more about it next time. No episode preview, I guess we’ll just have to be in the dark about it. QUESTION TIME! First impressions are always fun. What do you think of this season’s pick? Is it too much to know that Hibiki is already as good as dead? 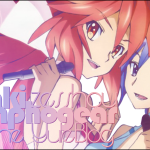 You can watch Symphogear either on Funimation or Niconico! Both are the same, but Niconico has a unique comment feature, so check it out after you’ve watched the episode at least once to avoid spoilers!